The family members of kidnapped victims speak on the radio, hoping that their messages of love and support reach the ears of their loved ones held in captivity. © Photo by Steve Salisbury. All rights reserved. In over a half-century of war, no Colombian warring group is clean of committing horrors, and there are ample examples to point fingers. Human-rights groups blame “paramilitaries” for committing the big majority of massacres in Colombia’s armed conflict. Up to some 60% to 80% of war-related killings in Colombia were imputed to “paramilitaries,” according to some human rights groups, while the guerilla groups were imputed with about 15% to 30% percent, and the government security forces rounding out about all of the rest. Carlos Castaño, the leader of the AUC who was reportedly murdered by a handful of his own cohorts in a power struggle supposedly involving his own brother Vicente, justified killing civilians whom the “paramilitaries” viewed as dangerous guerrilla supporters or as guerrillas passing themselves off as civilians because, if not, they could give the FARC information to attack “paramilitaries.” “Why wait until they come to kill you and your people? I have a responsibility to protect my people,” he told me in rural northwestern Colombia in 2000, as I recall, when I was working as a producer on a TV project for the Discovery/Travel channel’s “Robert Young Pelton’s the World’s Most Dangerous Places.” Human rights activists say that this logic has been at times cited when guerrillas have carried out “ajusticiamientos,” executions, of their enemies and when members of security forces have taken the law into their own hands and “disappeared” suspected guerrillas. Adding that atrocities have been committed by individuals of all warring groups, Fernando recalled that while he was once invited to an Army Reserve meeting years ago, he was horrified as an active-duty officer boasted that he unashamedly supported “paramilitaries” and had burned two captured guerrillas to death. In 2013, I mentioned the case of Fernando’s father to FARC peace negotiator “Jesus Santrich” in Havana and that the victim’s son would like to see FARC leaders in jail for at least 10 years. Santrich replied that family members of the FARC had been killed, too, and that the FARC is open to review its actions for possible mistakes. “This is precisely why it is imperative to achieve peace and stop this terrible cycle of war. Because if everyone continues to take an eye for an eye, then we all become blind,” said “Santrich,” who is blind from genetic eye-degeneration, except for a point of light in his left eye, he said, not helped by years in the jungle. The biggest single incident of killing attributed to a FARC unit was when at least some 70-plus civilians were reportedly killed in “collateral damage” in 2002 inside a church hit by a make-shift propane-cylinder mortar projectile launched by FARC guerrillas fighting “paramilitaries” in the village of Bojaya, in northwestern Colombia. The FARC called it a horrible accident. A FARC commission led by FARC Secretariat member and peace negotiator “Pastor Alape” was allowed by the government in 2015 to travel to the area to privately ask residents for pardon, and Pres. Santos says the Colombian government owes Bojaya an apology for not sending its troops there in time to protect it. “If soldiers and paramilitaries weren’t shooting at us from civilian areas, there wouldn’t be mistakes like that,” said a guerrilla to me. The military and “paramilitaries” had also made that same argument when civilians were killed in cross-fire, blaming the FARC for using “human shields,” which the FARC denies. 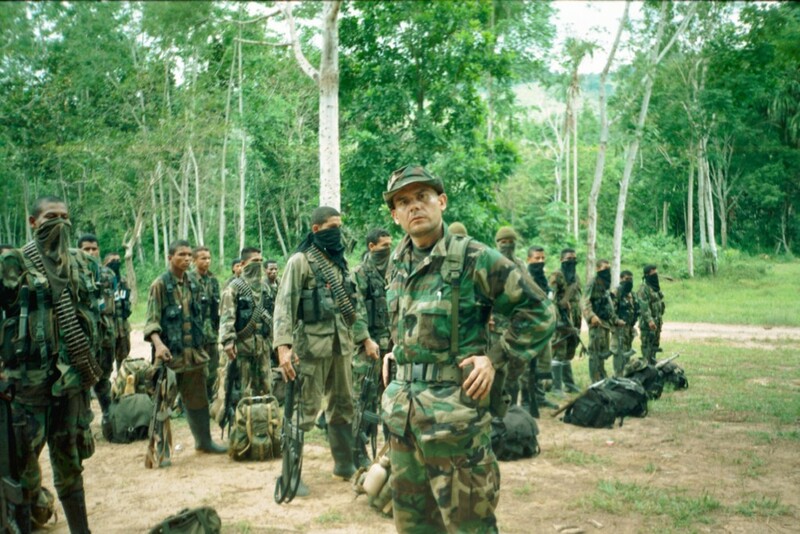 Carlos Castaño, the dead leader of the now-defunct United Self-Defense Forces of Colombia (AUC), reportedly killed in internal AUC power struggle, with his “paramilitaries” in northwestern Colombia in 2000. © Photo by Steve Salisbury. All rights reserved. While the Colombian government and great swaths of the Colombian populace blame the FARC for widespread mourning, Colombian military officers, and separately, “paramilitaries” had also made references to the United States dropping atomic bombs on Japan in explaining, if not justifying, the “messiness” of war. “You Gringos like to talk self-righteously about human rights, but the United States dropped the atomic bomb on Hiroshima and is hypocritical,” said Carlos Castaño, raising his horse voice and waving his arms, as I recall from our conversation. 2) What about Colombia’s Second-Largest Guerrilla Group, the “National Liberation Army” (ELN), in This? 4) Could Calls for a Military Solution Spike on Potential, New Frustrations over Prolonged Talks? What Is the Balance of Forces? 5) With the Colombian State’s Overwhelming Military Superiority, Why Even Have Peace Talks with the Guerrillas? 6) What Would Happen with No Peace Talks? 10) Why Is the FARC Still in Arms? Its Roots, What Does It Want? 11) What about FARC Weapons? What about the Colombian Armed Forces after an Overall Peace Accord Is Signed? 12) Would There Be Armed Dissident or Splinter Groups Peeling Away from the FARC after an Overall Peace Accord? 13) Does the FARC See the Clock Winding Down on Pres. Santos a “Strategic Advantage”? 14) Does the FARC Want to Run the Clock Out on Pres Santos and Wait for the Next President (Who Could Be Better or Worse for the FARC)? 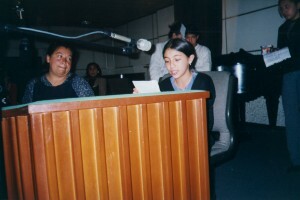 17) Smoke-and-Mirrors Impunity or an Historic Brilliant Balance between Peace and Justice in Victims’/Justice Agreement? 18) Pres. Santos Ceding Too Much or Not? What about the FARC and extradition? What about the FARC's "Simon Trinidad"? Will time run out on Pres. Santos? A "Memo of Understanding" to End War, if March 23 "deadline" Is Missed?